Note to reader: This is the untempered version of the GPP submitted, therefore, errors may be spotted! Title: Investigation on effects of various beverages on probiotics(Lactobacillus). Research Introduction: Inside us, there are the naturally occurring antibodies 'manufactured' by our immune system that are so called 'programmed' to detect and eliminate or neutralize the foreign threats in our body. However, they too have a limit and antibiotics for medical use are often brought in to help in facing the more dominant threats. With antibiotics introduced, there are positive benefits, but also negative impacts. These 'negative impacts' can be known as the antibiotic's side effects as stated in the prescription of these antibiotics. These side effects are caused by the antibiotics itself when performing its function as the harmless and beneficial bacteria are often caught in friendly fire, which ultimately disrupts the balanced composition of intestinal flora. These 'good' bacteria are called probiotics as stated in the above research title. As a result, we take probiotic drinks to counter this issue. Still, most probiotic drinks are required to be taken with an additional beverage. Now, we arrive at our research title, which is find out whether these beverages taken have any effect on the probiotics inside and outside our bodies. Research Question: As I have mentioned in the above paragraph, we want to find out whether the consumption of commonly consumed beverages affect probiotic growth, particularly lactobacillus in our body. As a result, our research question (not research title) is, “Do the beverages we consume affect probiotics (lactobacillus) or it’s growth in our body? If so, how?”. Hypothesis: Beverages do affect probiotic growth and we expect less than an average of 30% of them terminated. Hypothesis (expanded): There are two parts to this hypothesis, one is the question of whether it affects or not, another is the question of by how much. The first question comes in the process of this investigation while another is the end product. The first question is rather an easy question to answer with the help with the internet but you never know when it's really tested. Moreover, the use of lactobacillus as the probiotic and different beverages may result in varying results. The second one is no doubt the result we wish to achieve which will also be the root foundation of this research. Hypothesis (explanation): Our guess (hypothesis) is that the beverages we consume together with probiotic drinks will affect the probiotics, even with a percentage margin, which is below an average of 30 percent. However, the question still is, “why 30 percent?”. Previously, our research was initially about antibiotics' effect on probiotics and we hypothesized that less than 50 percent of the probiotics will be eliminated. Due to unforeseen circumstances, we replaced the antibiotics with beverages. As a result, we stick to the assumptions in our hypothesis and had to lower the percentage margin to 30 percent as it was only logical. To be short, if antibiotics would reduce the numbers by not more than 50 percent, then everyday beverages had to be lowered no matter what. And that explains the question of “why 30 percent?”. (c) Procedures: Detail all procedures and experimental design to be used for data collection. Dip and into the Yakult and streak the bacteria onto an agar plate. Wait 20 hours for bacteria to cultivate. 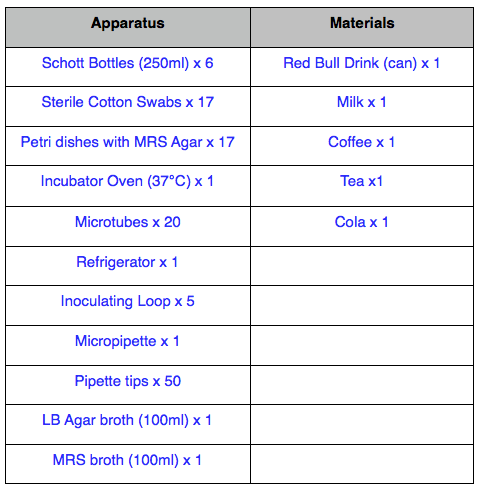 Take a micropipette and take some of the colony and drip it into a test tube. Repeat Step 5 for more test tubes and add beverages into the test tubes. Wait for bacteria to grow. Dip micropipette into bacterial solution and drip it onto agar plate. Wait for bacteria to cultivate. Compare different agar plates to see different growths. (d) Risk and Safety: Identify any potential risks and safety precautions to be taken. Risks: Risks in chemical hazards, biological hazards, and physical hazards. Cleaning agents and disinfectants, drugs, anesthetic gases, solvents, paints, and compressed gases are examples of chemical hazards. Biological hazards include potential exposures to allergens, infectious zoonotics (animal diseases transmissible to humans), and experimental agents such as viral vectors. The final category contains the physical hazards associated with research facilities. The most obvious are slips and falls from working in wet locations and the ergonomic hazards of lifting, pushing, pulling, and repetitive tasks. Other physical hazards often unnoticed are electrical, mechanical, acoustic, or thermal in nature. Ignoring these can have potentially serious consequences. Fire. There should never be open flames in the lab. Make it a working rule that water is the only nonflammable liquid you are likely to encounter. Treat all others in the vicinity of a flame as you would gasoline. Specifically, never heat any organic solvent in an open vessel, such as a test tube, Erlenmeyer flask, or beaker, with a flame. Such solvents should be heated in a hood with a steam bath, not a hot plate. Never keep volatile solvents, such as ether, acetone, or benzene in an open beaker or Erlenmeyer flask. The vapors can and will creep along the bench, ignite, and flash back if they reach a flame or spark. Chemical and Thermal Burns. Many inorganic chemicals such as the mineral acids and alkalis are corrosive to the skin and eyes. Likewise, many organic chemicals, such as acid halides, phenols, and so forth are corrosive and often toxic. If these are spilled on the desk, in the hood, or on a shelf, call for assistance in cleaning them up. Be careful with hot plates to avoid burns. Always assume that hot plates are HOT. Cuts. The most common laboratory accident is probably the cut received while attempting to force a cork or rubber stopper onto a piece of glass tubing, a thermometer, or the side-arm of a distilling flask. Be sure to make a proper-sized hole, lubricate the cork or stopper (lubrication is essential with a rubber stopper), and use a gentle pressure with rotation on the glass part. Severed nerves and tendons are common results of injuries caused by improper manipulation of glass tubes and thermometers. Always pull rather than push on the glass when possible. Absorption of Chemicals. Keep chemicals off the skin. Many organic substances are not corrosive, do not burn the skin, or seem to have any serious effects. They are, however, absorbed through the skin, sometimes with dire consequences. Others will give a serious allergic reaction upon repeated exposure, as evidenced by severe dermatitis. Be careful about touching your face or eyes in the lab; make sure your hands are clean first. Gloves will be available in the lab. However, gloves provide only a temporary layer of protection against chemicals on your skin and may be permeable to some chemical reagents, without visible deterioration. If your gloves come in contact with a chemical reagent, remove them, wash your hands, and get a new pair immediately. Inhalation of Chemicals. Keep your nose away from chemicals. Many of the common solvents are extremely toxic if inhaled in any quantity or over a period of time. Do not evaporate excess solvents in the laboratory; use the hood or a suitable distillation apparatus with a condenser. Some compounds, such as acetyl chloride, will severely irritate membranes in your eyes, nose, throat, and lungs, while others, such as benzyl chloride, are severe lachrymators, i.e. they induce eye irritation and tears. When in doubt, use the hood or consult with the laboratory instructor about the use of chemicals required for your work. Specific safety information about chemicals used is included in each experiment write up. MSDS (Material Safety Data Sheets) are available on the DCIS file server and summarize safety information about substances used in the lab. Ingestion of Chemicals. The common ways of accidentally ingesting harmful chemicals are: (1) by pipet, (2) from dirty hands, (3) contaminated food or drink and (4) food use of chemicals taken from the laboratory. Below are ways to avoid accidental ingestion of chemical reagents. • Wash your hands before handling anything (cigarettes, chewing gum, food) which goes into your mouth. Wash your hands when you leave the laboratory. • Do not eat or drink in the laboratory. Use the water fountains for a drink--not a laboratory faucet. Remove gloves and wash your hands before using the water fountain or bathroom. • Never use laboratory glassware as a food or drink container. • Never store food or drink in a laboratory refrigerator or ice machine. Never consume ice from a laboratory ice machine. Create a table (shown below). Take a picture of every petri dish, including control dish. Insert picture under the header, “Photo of petri dish” according to respective beverages. 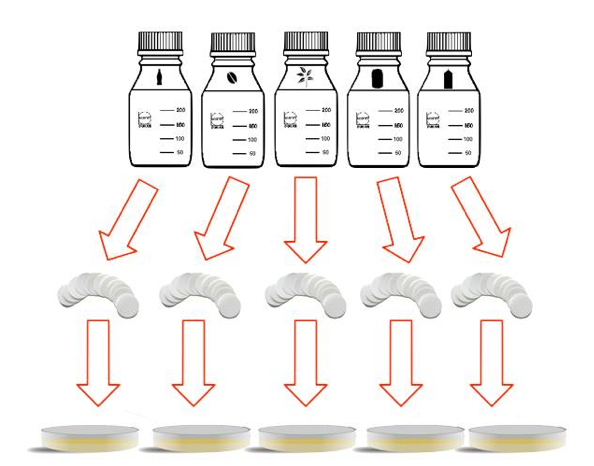 Compare amount of lactobacillus in any individual petri dish with control dish. 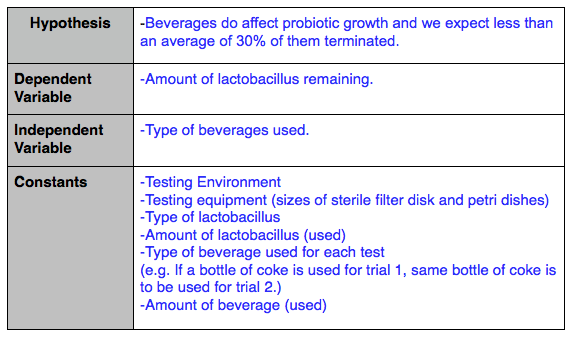 Estimate percentage of amount of lactobacillus in petri dish compared to control dish and record it below the header, “Percentage of amount of lactobacillus compared to control” on the given table below according to respective beverages. Repeat steps 4 and 5 for remaining beverages. If the percentage is less than 30%, it’s effects on lactobacillus is negative (kills or discourages growth). If the percentage is more than 100%, it’s effect on lactobacillus is positive (encourages growth). If the percentage is ranging between 30%-100%, it’s effect on lactobacillus is neutral. If the percentage is less that 30%, fill in as “not recommended”. If the percentage is more than 100%, fill in as “recommended”. If percentage is ranging between 30%-100%, fill it in as “acceptable”. D. Bibliography: List at least five (5) major references (e.g. science journal articles, books, internet sites) from your literature review. If you plan to use vertebrate animals, one of these references must be an animal care reference. Choose the APA format and use it consistently to reference the literature used in the research plan. List your entries in alphabetical order.